Imagine a the pharmaceutical companies 20 or 30 years from now. Moving beyond conventional drugs that interact biochemically with the body, it will have built a big “bioelectronics” business that treats disease through electrical signaling in the brain and elsewhere. Neurological problems, from stroke and epilepsy to depression, will be treated through electronic implants into the brain rather than pills or injections. Even diabetes and obesity will be attacked in ways that seem like science fiction today, by sending electrical signals to malfunctioning cells. That remarkable vision comes from one of the world’s most powerful pharmaceutical executives, Moncef Slaoui, head of research and development at GlaxoSmithKline, the British drug company. “At present every pharmaceutical and biotech company makes chemical or biological molecules that target [biochemical] structures such as proteins in the body,” said Mr Slaoui. With enthusiastic support from Sir Andrew Witty, his chief executive, and other senior colleagues, Mr Slaoui wants GSK to become the first large company to make bioelectronics a central plank of its long-term planning. “The sciences that underpin bioelectronics are proceeding at an amazing pace at academic centers around the world but it is all happening in separate places,” he says. This phenomenon is in its infancy. Although GSK appears to be ahead of the competition in preparing for this transformation of the industry, it is not yet ready to pump large amounts of direct funding into bioelectronics. Instead, the company is preparing to play a coordinating role. That will involve setting up a bioelectronics institute, offering a large prize for innovation, and pulling in funds from endowments and venture capitalists. Work is currently mainly conducted in universities and commercialization remains extremely limited. Today, only a minuscule fraction of the electrical activity in people’s brains can be read by computer. Even so, recent experiments have given spectacular results. 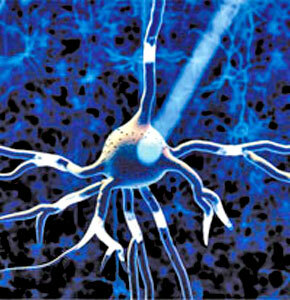 Optogenetics - a technology developed in the past decade - enables neuroscientists to manipulate brain activity with light. It has become an invaluable tool for investigating the roles of different types of neuron, or nerve cell, in experimental animals and could eventually be used to treat human diseases. It has taken brain biology by storm. “Ontogenetic tools are now in use by many hundreds of neuroscience and biology labs around the world,” says Ed Boyden of the Massachusetts Institute of Technology, who has played an important role in its development. The technique involves the genetic modification of neurons to make them produce opsins - light-sensitive proteins that are normally made in photoreceptor cells in the eye and in some micro-organisms. These ontogenetic neurons can then be switched on and off with different light signals, making brain activity controllable. “Optogenetics is a form of wireless communication in which nerve cells in the brain are programmed genetically so that you can control their electrical activity with an optical remote control,” says Gero Miesenböck of Oxford University, another pioneer of the field. Studies were carried out first in cultures of human neurons and in simple organisms such as roundworms and fruit flies, and then in mice and monkeys. “What optogenetics can help us do is to pinpoint the cells that are causally responsible for our behaviour,” Prof Miesenböck says. Last week, Prof Boyden and colleagues published in the journal Current Biology the first evidence of changing the behaviour of monkeys - the way the animals move their eyes - through optogenetics. Though the technique is not yet ready for clinical use, experts see great promise in the long term. “There could be the possibility of using ontogenetic manipulations directly in humans, in order to restore neural signals that have been corrupted or lost because of injury or disease,” says Prof Miesenböck. Human optogenetics will require two operations. First the light-sensitive genes are introduced to the patient’s neurons - probably carried in a harmless virus, as with other applications of gene therapy. Later a fine fibre-optic cable is inserted through a small hole drilled in the skull to illuminate the target area of the brain. A likely target is Parkinson’s disease, where optogenetics could provide much more precise therapy than the electrodes that are today inserted into patients’ heads to provide deep brain stimulation. Perhaps the most remarkable was a recent US clinical trial in which tetraplegic patients used their thoughts to direct robotic arms. The research team, led by John Donoghue and Leigh Hochberg at Brown University, released a video of a 58-year-old patient called Cathy, whose mental activity drove a robot to pick up her drinking bottle from a nearby table and move it up to her mouth so that she could sip some coffee. A heartwarming smile illuminated Cathy’s face after she had drunk without help from a human carer for the first time in 15 years. The BrainGate system developed by the Brown University team has a sensor, about the size of a small aspirin pill, with 100 hair-thin electrodes implanted into the top of the patient’s motor cortex, the brain area that controls movement. It is connected to an external computer, which translates the neural activity into commands to drive a robot. Still, there will never be a mass market for personal robots - or even prosthetic limbs - controlled by tetraplegics. So Prof Donoghue and his colleagues are working on a second generation system, BrainGate 2. This would send signals from the brain to a Functional Electrical Stimulation (FES) device, bypassing the injury that blocks the natural transmission of nerve signals and stimulating the patient’s own paralyzed muscles to contract on demand. This example illustrates how advances in the motor control would have to operate in parallel with work on other parts of the body that help balance, such as the inner ear. 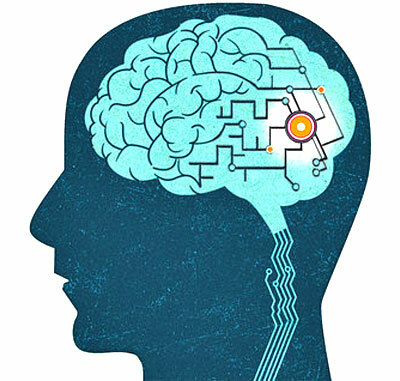 For many applications, invasive interfaces such as BrainGate, which are fitted surgically into the brain, may not be appropriate. Other researchers are working with electroencephalography (EEG), which detects electrical activity noninvasively through electrodes, placed in mesh-like caps on the outside of the skull. The École Polytechnique Fédérale de Lausanne in Switzerland runs one of the world’s most advanced brain computer interface programs using EEG. At the University of Western Ontario in Canada, Adrian Owen and colleagues are using EEG to show that some patients with severe brain injuries, who seem to be minimally conscious or in a vegetative state, actually display the mental signature of full consciousness. For example, when the researchers ask the patients to imagine moving their right and left hand and toes, about 20 per cent of them produce patterns of brain activity indistinguishable from a healthy person following the same commands. “It’s astonishing,” says Prof Owen. Now researchers at Western Ontario and elsewhere are working to translate these findings into a system that would unlock the brains of people who are too paralyzed even to communicate by blinking their eyes to order. “We want to get to the stage where they can spell out words with characteristic brain activity for each letter of the alphabet - and we can work out in real time what they are saying,” Prof Owen says. “But if a patient feels that way, it is surely better that he or she should be able to express it,” he says. While enabling people who are completely locked in to communicate - or tetraplegics to walk - might be the most striking demonstrations of neurotechnology, treatments for less serious disabilities and for brain diseases represent a vastly greater market. Epilepsy is a tempting target. It is one of the most common neurological disorders, affecting 50m people worldwide; it is poorly controlled with conventional drugs; and it is caused directly by electrical malfunctioning of the brain. Several researchers are using bioelectronics to investigate exactly where the abnormal electrical firing starts and how it spreads across the brain. Then, armed with this knowledge, they hope to intervene to prevent seizures. Some of the best bioengineers in the US, including John Rogers of the University of Illinois, Brian Litt of the University of Pennsylvania and Jonathan Viventi of New York University, are developing a new generation of soft computer interfaces, made with flexible silicon circuitry that can bend and stretch to match the curves of the brain. Their “smart skin” is particularly well suited to investigate and later treat epilepsy. It will be implanted under the skull, lying on top of the brain but not penetrating the grey matter. The consumer electronics industry is developing headsets that claim to let users control computers and games through their thoughts. But neuroscientists say these are too crude for clinical applications. Neuromarketing companies also use EEG caps to measure consumer preference. Several small companies are active in clinical bioelectronics. For example mc10, based in Massachusetts, is commercializing the smart skin developed by Prof Rogers and colleagues. There are also companies working in two clinical fields that have become established in relative isolation from the rest of bioelectronics research: cochlear implants translate sound into auditory signals for deaf people; “deep brain stimulation” reduces tremor in Parkinson’s patients, though its precise mechanism of action remains uncertain. Commercialization remains fragmentary, however, says Prof Donoghue. Although bioelectronics research currently focuses on the brain, its potential extends much wider. For instance, it might be possible to treat obesity by sending local signals to cells in the stomach or gut that would control the patient’s appetite, without involving the brain. Or, if cells in the pancreas fail to make enough insulin in diabetic patients, a signal could be sent to cells elsewhere to do the job instead. “The beauty of electrical signalling is that it has only a local effect,” says Mr Slaoui. In contrast, even a well- targeted drug drenches the whole body in unwanted chemical. Mr Slaoui senses that this is a moment comparable to the birth of the modern pharmaceuticals industry at the end of the 19th and beginning of the 20th century, when chemicals companies began to realize that they could design compounds with a biological effect. If bioelectronics achieves even half as much as GSK expects, it will transform the drugs industry over the next generation or two.